The natural process of eliminating waste substances from the body takes place all the time. This detoxification is dependent on the organs of elimination functioning optimally. These include the liver, kidneys and digestive system. Reducing exposure to toxins in the environment and avoiding foods and drinks which require a lot of processing by the liver, such as alcohol and fatty foods, are also important. Certain nutritional supplements may also help support your body during the detoxification process. 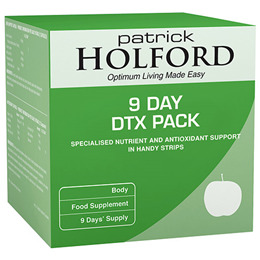 Patrick Holford 9 Day Detox Pack provides an easy way to supplement a detoxifying diet. The Detox Pack is presented for extra convenience in a handy blister pack containing a daily regime of antioxidants, digestive and body support to help support the body`s natural cleansing processes. 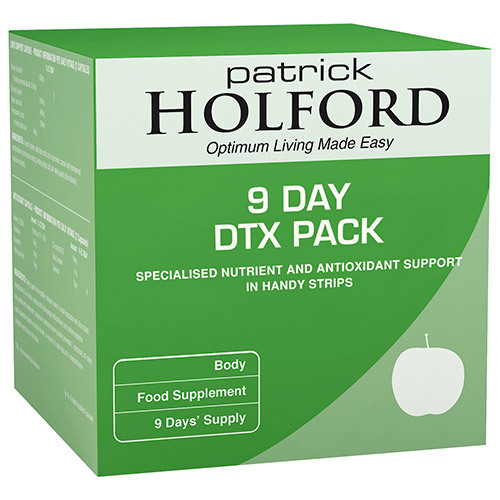 9 Day Detox Pack should be taken alongside the Patrick Holford Optimum Nutrition Pack to provide comprehensive nutritional support. Digestive support is provided by a potent combination of enzymes, probiotics and glutamine powder. N-acetyl Cysteine, Alpha Lipoic Acid, Calcium Gluconate, Capsule Shell (hydroxypropyl methylcellulose), Pomegranate Extract (Providing Ellagic Acid), Anti-caking Agent (Silicon Dioxide & Vegetable Magnesium Stearate). L-Glutamine, Capsule Shell (hydroxypropyl methylcellulose), Amylase Preparation (with Potato Maltodextrin), Lactase Preparation (with Potato Maltodextrin), Alpha Galactosidase Preparation (with Potato Maltodextrin), Lipase Preparation (with Potato Maltodextrin), Protease Preparation (with Potato Maltodextrin), Maltase Preparation (with Potato Maltodextrin), Invertase Preparation (with Potato Maltodextrin), Anti-caking Agents (Silicon Dioxide, and Vegetable Magnesium Stearate), Lactobacillus acidophilus, Bifidobacterium bifidum, Bifidobacterium lactis. Bulking Agent (Microcrystalline Cellulose), Vitamin E Acetate (Preparation with Silicon Dioxide, Monoglycerides & Corn Starch), Capsule Shell (Hydroxypropyl Methylcellulose), Beta Carotene Preparation (Beta Carotene with Maltodextrin), Polygonium Cuspidatum Powder (Providing Resveratrol), L-Glutathione, Anti-caking Agents (Magnesium Stearate and Silicon Dioxide), Co-Enzyme Q10, Alpha Lipoic Acid, L-Selenomethionine (Preparation with Dicalcium Phosphate). Take the contents of two strips daily with food, one strip with breakfast and one at lunchtime. Follow this with the sachet of glutamine powder mixed into water in the evening. Do not take if pregnant, planning pregnancy or breastfeeding. Below are reviews of Patrick Holford 9 Day Detox Pack - Antioxidant Support by bodykind customers. If you have tried this product we'd love to hear what you think so please leave a review.